If you think Nando’s Extra Extra Hot Sauce is child’s play then you’ll probably be interested in the new chilli sauce in town that promises to pack a punch and then some. 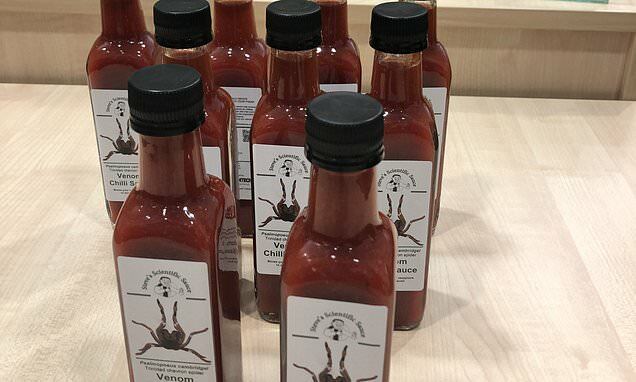 Steve’s Scientific Venom Chilli Sauce has been engineered to mimic the bite of a spider, the venom of which leaves its victims with ‘muscle spasms and burning pain’. The spicy creation was concocted by Steven Trim, the managing director and founder of Kent-based Venomtech, and food marketer Stefano Cuomo. ‘It was about two years ago when we had that first light bulb moment,’ Trim said. 'I laughed it off at the time and said it was hilarious to do. Nobody has been foolish enough to try the venom.